What Are the Characteristics of Dolphins? What Animals are the Prey of Dolphins? What Is a Dolphin's Life Span? There are plenty of movies and TV stories where an intelligent dolphin "saves the day" for humans living along the waters. A dolphin may never rescue you, but these remarkable marine animals entertain people and help researchers learn more about the aquatic world. Dolphins can live for decades, but health issues, injuries, predators and human activity can shorten the dolphin lifespan for many of these splendid creatures. Dolphins come in a variety of sizes, with the orca dolphin weighing up to 10 tons and stretching to 10 meters (33 feet). On the other hand, Maui's dolphin, nature's smallest, only reaches 1.2 meters (4 feet). As the National Oceanic and Atmospheric Administration notes, these animals are "an important sentinel species" that can warn humans of health risks associated with ocean water. Because dolphins sit at the top of the ocean food chain, they can help scientists monitor that environment and identify issues that threaten the oceanic ecosystem. A dolphin's life span varies according to its environment and species. Although some bottlenose dolphins can reach 40 years of age, their average age is between 15 and 16 years. 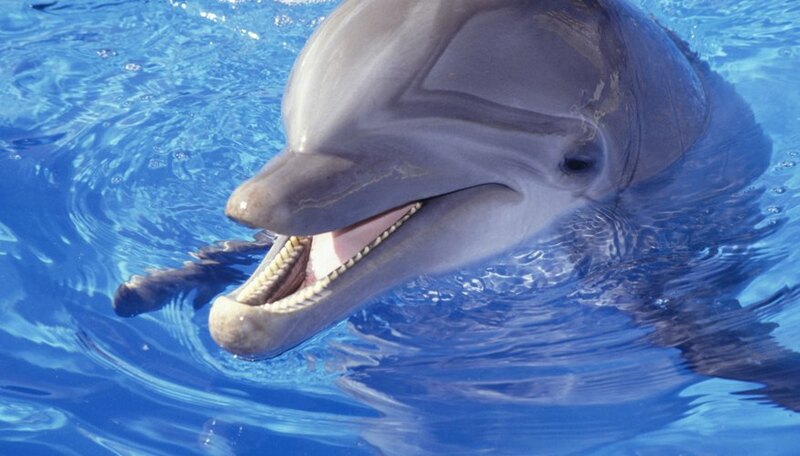 Forty is an old age for a dolphin -- one making it to 40 is comparable to a human living to be 100. According to the Institute for Marine Mammal Studies, the oldest dolphin aged scientifically in the wild was 48 years old. The dolphin life expectancy in captivity appears similar, as the oldest dolphin in captivity was over 50. The ocean, like dry land, can be a hazardous place to live. Although humans and dolphins eat similar seafood, dolphins encounter more health risks because of tainted water supplies and toxic algae. When dolphins sleep, their bodies show signs of insulin resistance associated with type 2 diabetes. After they wake up, they become normal again and show no signs of insulin resistance. Scientists are studying this phenomenon hoping to find treatments for humans with this disease. However, even though dolphins turn insulin resistance off, they can still experience health problems similar to diabetes. Although dolphins and sharks usually avoid each other, sharks may still attack dolphins that are sick or very young. Young dolphin calves can't swim as fast as adult dolphins or protect themselves from sharks. Before a female gives birth, other dolphins surround her to shield her calf from nearby sharks. However, even with adult protection, in some dolphin species up to half of the calves die before reaching maturity. Killer whales, which are also dolphins, can attack regular dolphins. Dolphins can end their lives early by stranding themselves on a beach. Lone dolphins usually become stranded because of illness or injury. Scientists theorize that mass strandings occur for several reasons: Dolphins in a group may follow their leader as it moves out of the water onto the shore. Dolphins that navigate using the earth's magnetic field could strand themselves after magnetic field disturbances occur. A sloping beach may also prevent a dolphin's sonar from detecting the beach before landing on shore. Fishing nets can be lethal when dolphins swim into them accidentally. Monofilament gillnets are particularly hazardous to dolphins because it's difficult for them to detect that material using sonar. Because dolphins must surface to breathe air, they can drown if a net or supporting ropes entangle them below the water. Biologists estimate that 300,000 dolphins and similar cetaceans suffer injury and death each year because of fishing practices. Fishermen in some countries, such as Japan and Taiwan, also hunt and harvest dolphins. Lee, Kevin. "What Is a Dolphin's Life Span?" Sciencing, https://sciencing.com/what-dolphins-life-span-4586901.html. 07 August 2018. How Does Pollution Affect Dolphins? How High Can Dolphins Jump?